Proudly made in the USA. Also in 180ct-720ct value sizes and Liquid form as well. Glucosamine for dogs can help Repair, Rebuild and Renew dog joint cartilage. 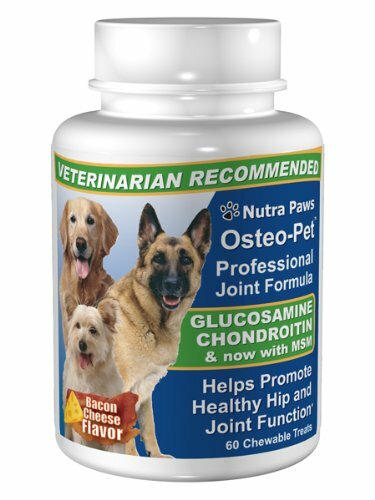 Glucosamine Chondroitin for dogs is a bacon & Cheese flavored treat for the assistance of canine arthritis and hip dysplasia. As dogs of all sizes get older, they tend to lose flexibility in their joints due to natural deterioration and aging. Glucosamine for dogs can help repair and renew the cartilage by providing the matrix that joint cartilage uses to rebuild and regenerate.